Sorry it has taken me so long to get to these images. I guess it was too much for me to swallow all at once! On September 10, Cassini flew by Iapetus. Two weeks ago, on the first day of the Division of Planetary Sciences meeeting, several of the science teams released beautiful products that give an early look at some of the science results from the encounter. The images are spectacular, of course. I've already posted an amateur grayscale version of this one; here, now, is an enhanced-color view of the trailing side of Iapetus in all its detailed glory. As Cassini departed Iapetus on September 10, 2007, it turned back to capture this 15-frame false-color mosaic on the moon. The image shows Iapetus' trailing side, which is mostly covered with the bright white ice common to outer solar system icy satellites. But the surface is stained with the dark material that covers Iapetus' leading side. The dark material fills some fissures, appears on the flanks of large basins, and even falls in linear chains in the upper left of this image. Also noteworthy are two enormous, unnamed, overlapping impact basins at the lower left. The 21 images for this mosaic were captured by Cassini as it receded from its close flyby of Iapetus on September 10, 2007. The mosaic covers the equatorial region on Iapetus' trailing side, including the Voyager mountains on the right. The mountains continue as a line of approximately eight peaks all the way across the image. This area is transitional between the dark terrain of Iapetus' leading side (to the right) and the bright terrain of its trailing side (to the left). In this high-resolution view, it appears that there are no "gray" areas; all areas are either bright or dark. Most crater floors are dark, while rims are brighter. This view has been cropped and reduced to 50% of its original size. There's dark stuff, there's white stuff, but no gray. 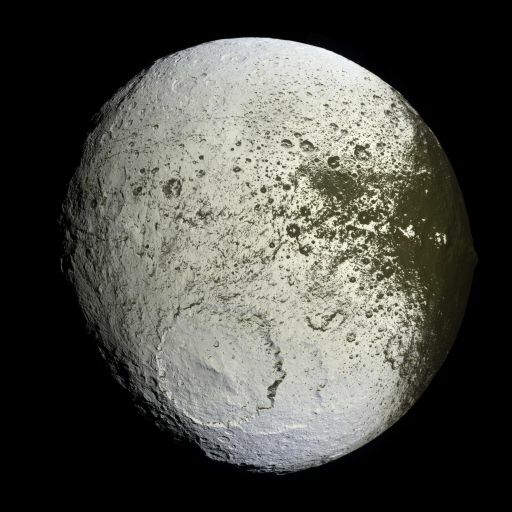 Everything on Iapetus appears to be either dark or light, with nothing in between. That's an important clue to what's going on to make Iapetus look as strange as it does. Here's another clue: in the highest-resolution images that Cassini captured as it was flying over Iapetus' equator, you can see quite a few tiny (a few tens of meters across, smaller than football fields), fresh, bright-rayed craters have punched through the dark material. It was a bit hard to figure out what we were looking at in this image, so I dug up the wide-angle shot that was taken at the same time as the narrow-angle views to show you that the narrow-angle mosaic is on one flank of one of the Voyager mountains along Iapetus' equator. One presenter at DPS calculated that, based upon the abundance of these little craters, whatever process it is that darkens the leading side of Iapetus does so on a very short time scale, less than 8 million years (and possibly less than 50,000 years!) The range in age dates is because there are two competing models for impact cratering rates in the outer solar system, and they are pretty substantially different. This panorama cuts across the northern flank of one of the Voyager mountains along Iapetus' equator within the dark terrain on the leading side, and (when enlarged) shows features as small as 10 meters across. The most striking thing about this mosaic are tiny bright splotches, which represent small, relatively recent impact craters that punched through a very thin dark layer to bright ice below; some of the little craters have bright, icy rays. The fresh craters are so much brighter than the dark terrain that some of them required special contrast adjustment so that they would not appear saturated in this image. At the DPS meeting, imaging team associate Tilmann Denk presented these images and also talked about some of the geometry of the Voyager mountains. He said that in Cassini images they measured maximum heights of 18 kilometers and widths of about 70 kilometers, but those were just measured relative to the break in slope at the mountain bases; he said that, when measured relative to the "reference ellipsoid" that represents the global average shape of the moon, the mountains are even taller. He also looked to see how far into the trailing side the Voyager mountains went. It's a bit hard to spot them -- Tilmann used stereo imaging techniques to see them -- but he found at least seven more bright mountain peaks marching along the equator into Iapetus' trailing hemisphere. In the east-centeral portion of the trailing hemisphere, there is no stereo image coverage, so he isn't sure about whether there are mountains in that region. Then, from the center of the trailing hemisphere west to the center of the sub-Saturnian hemisphere, or in other words, for one quarter of Iapetus' surface, there are no mountains at all. Whatever mechanism created these equatorial mountains somehow missed doing it to at least one quarter of Iapetus. 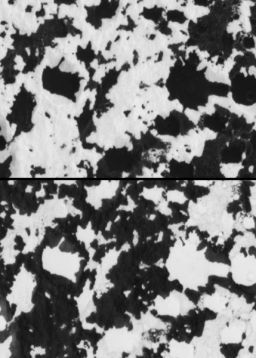 Tilmann concluded that the images support the following story for the formation of the bright-dark dichotomy on Iapetus: dark, reddish outer satellite dust gets deposited onto Iapetus, preferentially on the leading hemisphere, which causes a global color dichotomy where the leading side is redder than the trailing side. The slight imbalance in brightness and color causes a thermal redistribution (more on that in John Spencer's presentation below), which removes water ice from low latitudes and deposits it in polar latitudes. OK. Next, here's an image of Iapetus from the Visual and Infrared Mapping Spectrometer, or VIMS. I think it's quite notable that the stuff on Iapetus appears almost as segregated to VIMS as it does to the cameras. The news at DPS from this instrument team is the discovery of "Rayleigh scattering" in Iapetus' bright ice. This indicates, the VIMS team says, that there are extremely tiny, widely separated particles buried in Iapetus' ice on the trailing side. The Rayleigh effect is strongest where there is the least amount of pollution of the ice, near Iapetus' poles, again pointing to cleaner ice near the poles and dirtier ice near the equator. These images of the transitional area on the west side of Iapetus' dark region, including the Voyager Mountains, were taken by Cassini's Visual and Infrared Mapping Spectrometer as the spacecraft sped away from its September 10, 2007 encounter with Iapetus. 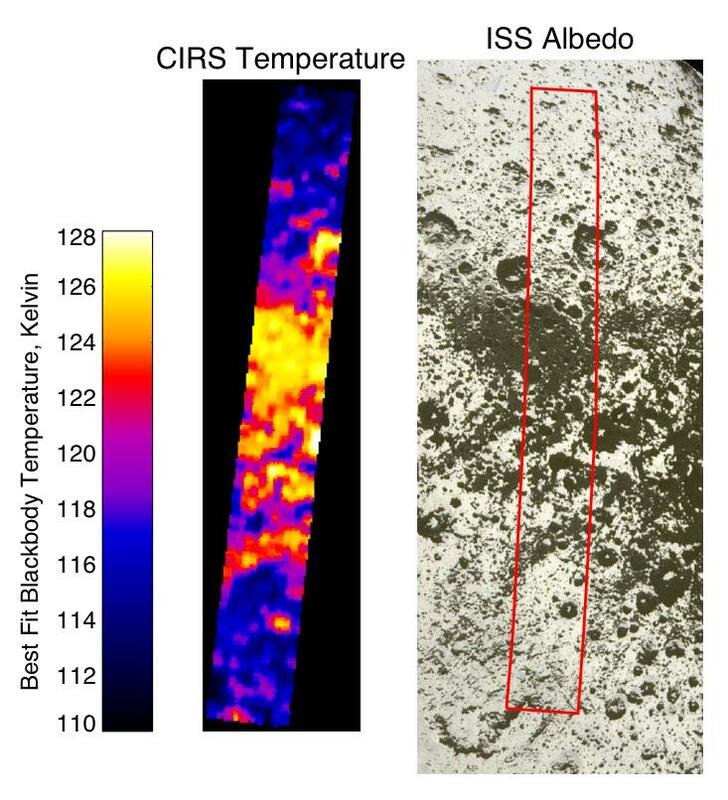 The left image in the figure shows the amount of reflected light at an infrared wavelength of 1.75 microns, and is similar to visible-wavelength albedo images. The color image on the right shows the results of mapping for three components of Iapetus' surface: carbon dioxide that is trapped or adsorbed in the surface (red), water in the form of ice (green), and a newly-discovered effect due to trace amount of dark particles in the ice creating what scientists call Rayleigh scattering (blue). The Rayleigh scattering effect is the main reason why the Earth's sky appears blue. The Rayleigh scattering effect on Iapetus provides evidence that tiny grains, smaller than the wavelength of visible light (less than 0.5 microns) have been embedded in the surface of Iapetus. The tiny grains must be well-separated for the Rayleigh effect to become prominent, so the abundance of particles must be less than about 2 percent. The Rayleigh scattering effect shows in all areas, although weakly in dark regions (the red carbon dioxide dominates the color image), and it appears stronger away from the equator. Investigating the trend from dark to bright areas, the Rayleigh effect changes with the amount of dark material in the ice, and becomes weaker as more dark material is added. This points to cleaner ice as one moves north or south from the equator and away from the dark leading side of the moon (toward the right in the image). During his presentation at DPS, VIMS team member Roger Clark also reported the same Rayleigh scattering effect on Phoebe, Dione, and in Saturn's rings and the small ringmoons. He said that this implies a common origin for the tiny particulate material, and that it's pervasive throughout the Saturn system. He suggested that this material comes from elsewhere; not only is its origin external to the moons, it may be external to the Saturn system. OK, next, here's an image from another spectrometer, CIRS, that looks at part of the electromagnetic spectrum even longer than the cameras or VIMS. Once again, I think it's quite unusual how well you can match features visible in the CIRS image to the camera (ISS) image. You can see temperature differences between crater walls and floors. Everwhere you see dark material, you see warm temperatures in CIRS, and everywhere you see bright material, you see cool temperatures. Cassini's Composite Infrared Spectrometer (CIRS) maps the thermal radiation emitted by cold surfaces in the Saturn system. By examining the shape of the emitted spectrum at relatively long wavelengths of 9 to 16 microns (roughly 20 times longer-wavelength than the human eye can see), the CIRS team can determine the temperature on the surface. Here, a CIRS measurement cuts across light, dark, and transitional terrains on Iapetus. The temperatures in the dark areas are, at 128 Kelvin (minus 229 degrees Fahrenheit), considerably warmer than the temperatures in the bright areas (113 Kelvin or minus 256 degrees Fahrenheit). Both temperatures are very cold, but ice is much more likely to sublimate at temperatures of 128 Kelvin than 113 Kelvin. In fact, over a period of a billion years, about 20 meters of ice is expected to sublimate at those temperatures. The cooler bright regions would only lose about 0.1 meters of ice in the same period. Ice sublimating from warmer, dark areas would re-condense to the surface all over the moon, but would be "trapped" on the cooler, brighter regions, a process called thermal segregation. This process is most likely responsible for the presently extreme segregation of bright and dark areas on Iapetus, but it doesn't explain how the dark part of Iapetus was darkened in the first place. 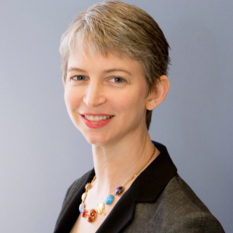 At the DPS meeting, John Spencer reported that CIRS got close enough that it was able to sample, in some places, pure bright material, and in other places, pure dark material, so they can really figure out the contrasts between the two. Because the dark stuff is so much warmer, the ice there is much more mobile, sublimating to vapor 200 times faster than ice in the bright areas. John said, "When you have dark ice that can sublime, sublimed ice is trapped on bright areas, and you get a thermal runaway process. Small initial variations become very large final variations. We saw this in the late 1990s on Callisto. Thermal segregation happens whenever the ice is warm enough. This is presumably what is happening on Iapetus, and why we don't get any shades of gray." So, John's model goes like this: "Assume Iapetus is covered in ice. Infalling material darkens the leading side. Dark, warm ice evaporates and recondenses elsewhere. Evaporation stops when a millimeter of ice has been evaporated." He showed a computer model he has developed, the same one he presented at DPS in 2005. Unfortunately for John, he hasn't managed to sit down and write a paper for publication on his model yet, so I am guessing it will appear in print first on the CIRS paper that is published in an upcoming special issue of Science about the Iapetus encounter, on which John will not be the first author. So the Cassini team seems to be converging on agreement on an explanation for how Iapetus came to look the way it does. It's a combination of two factors: external pollution by a small amount of fine, dark particulate material being preferentially deposited on the leading hemisphere, and Iapetus' unusually slow rotation rate. Slow rotation means that its dayside gets much hotter than the daysides of others of Saturn's icy moons, which can help get the ball rolling with John Spencer's runaway thermal segregation model. And once that gets started, it's just a positive feedback cycle; ice is sublimed from the equatorial regions of the leading side, which darkens the leading side, which makes it warm even more during the long day. If the Cassini team is reaching consensus, though, the rest of the outer planets community is not. I talked with two different outer planets people not involved in the Cassini mission who told me they think the model is no good. And one of them mentioned something that's been a topic of broader conversation about Iapetus: is Iapetus' surface white-on-black or black-on-white? I mentioned this question to Tilmann Denk, who laughed and proposed the following experiment. Take a look at the images below. They represent the same area on Iapetus. One shows the image as it was taken by Cassini's camera; the other has been inverted -- it's a photo negative. Which one is which? Can you tell? Iapetus: Black on white or white on black? I actually think this is not a useful question. To run with the Cassini team's model, Iapetus' dichotomy may have been started by a small amount of dark material being deposited in the ice, making the bright ice just slightly less bright. So it may have started with dark being deposited on bright, but the dark deposits weren't anything as dark as what we see on Iapetus now. Then, it was darkened when ice sublimated from underneath the warm, dark deposits. That ice got redeposited elsewhere, so in those places, you have white on black. Iapetus may not be either white-on-black or black-on-white; it may be white-on-black-on-white, or even white-on-black-on-gray. So now I've written too much; but there'll be much more to come, I'm sure!